TRYOUTS TO BE A MOM? Jason McLane needs a wife…or to be more precise, a woman who’ll love and care for his children. But most of the widower’s dates (when he has time to date) sneak away when they find out he has six kids. So Jason decides to try online dating—with one caveat. The candidate will be trying out for the Mom job. At his home. With his children. Natalie Calloway loves kids. But most of her dates sneak away when she tells them she wants a large family. The pitying looks from her sisters, all happily married and with children, are getting to be a bit much. So Natalie resorts to online dating. When Natalie reads Jason McClane’s profile bid, she stops short. Sure, she’s almost twenty-nine with no real boyfriend prospects, but a ready-made family? Then again, time’s running out if she really wants to have a big family. When two candidates show up at once the fun begins. Between the children's antics, the Moms-to-be and their foibles, the stable hand's unwanted advice, and the happy-go-lucky, trouble-causing puppy, what could go wrong? He eyed his children sitting around the table eating supper. The three oldest were creating catapults out of stainless steel forks. Soon peas would be hurtling across the table. The three youngest slapped mounds of mashed potatoes with their spoons and giggled like lunatics as spud projectiles fanned into the air like creamy fireworks. Their mother had been gone only a year, and his happy home had slipped into chaos and disarray. He shuddered. He needed to break the news to this rowdy brood, but he was more terrified of his children today than he’d been when he’d fallen off the roof at thirteen. On his way down, he’d been sure he was about to die. How many times had his mother drilled into him that he was “gonna fall and break his neck”? That day he’d thought her words were prophetic. Facing his six children with this latest news was far worse than facing the fast-approaching hedgerow that lined his childhood front-room window. A ball of flying mashed potato drew his attention and he watched it splat on the wall. This had to stop. He had to do it soon. Tell his kids. Christmas was fast approaching, and he didn’t think he could face it alone. Sure, his mother could help some, but he couldn’t impose on her too much. With his two youngest brothers still at home and his three sisters and their kids coming this year, Christmas would be busy at his mom’s, too. Maybe he could forego all the Christmas preps here and just descend on his parents, six kids in tow. He stared hard at his children. No, he couldn’t do that. No Christmas tree, no decorations, no lights, no stockings here? Much as he dreaded the holiday, he couldn’t go that far. His progeny would probably shoot him—if they knew how. He looked at them again. Yep, they knew how to shoot things. He vaguely recalled a stuffed bear that had committed some wartime misdeed when the boys were playing and then was duly executed for his crime. In a flash of inspiration, and because of the wailing of the owner of the stuffed bear, Jason had been able to give the bear a full pardon for dereliction of duty, just as Abraham Lincoln had done for his son. But knowing his kids, his own demise would be more likely to involve fire and blowing up stuff. He shook his head free of irrelevant things. He was avoiding making the announcement. When had he become such a pushover? “Stop,” he didn’t speak loud. The kids immediately set down their utensils and gave him their undivided attention. They hadn’t quite forgotten their manners; evidently they’d just put them on hold. Now, how could he break this to them gently? He glanced around the table. Six pairs of eyes, bright, intelligent, and terrifyingly astute, waited expectantly. Even three-year-old Adam gave him a look that scared him right down to his bones—as if Adam knew what Jason was about to announce. He’d just have to dive in, no equivocating, no trying to make it sound better than it might be. “What?” Stone, Larissa, and Joe shrieked it together. 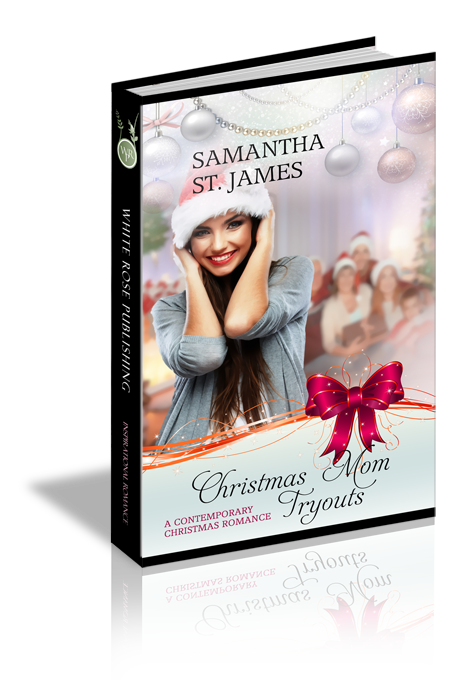 “You advertised for a mom without telling us?” Ten-year-old Larissa was ready to cry; he recognized that look. “Dad, why’d you do that?” The fourteen-year-old tried to be mature. Stone took the role of oldest brother seriously. “Because of my job. They’ve held off having me travel out of courtesy over your mom’s death. As much as I love being with you guys all the time, traveling is a necessary part of my job, and I need to do it.” And I need help. I can’t do this on my own, he added silently. Raising kids alone was hard. Raising kids alone while missing your wife so much if felt as if your heart was littered with buckshot, was almost impossible. Half the time he thought he’d die of grief and loneliness. The other half of the time, he thought he’d just go crazy. “And you all need manners and…and stuff,” He added. “And we just need a mom here…to do…mom things with you.” He sounded lame. “And cooks and cleans and does laundry? You know that’s called a maid, right?” Larissa, his budding little feminist, gave him a look that reminded him of his late wife…the look that said he’d done something sexist, and he’d better right it soon. “OK.” Larissa settled back, mollified. “I’ll make sure you’re not slaving.” The sarcasm was lost on Jason’s oldest daughter. “She’ll have to like fireworks,” Joe’s tone was ominous. “And she better like dogs.” Anna piped up. “And know how to sword fight.” Stone’s look was mischievous. “And wide a wunicycle.” Emily was fascinated with unicycles for some strange reason. Maybe his four-year-old understood more of this mommy-getting business than he’d thought. “Will she be here for Christmas?” Joe’s favorite time of year was always on his mind. He loved helping with the decorations, the cookie baking, everything. He’d even helped Jason and Stone put up the lights in the freezing cold last year. He planned his allowance around the Christmas gifts he bought throughout the year and squirreled away in a secret hiding place he refused to share with his siblings, much to their dismay. “And she has to…has to love us.” Larissa’s eyes were bright with tears. “And we have to love her, too.” Stone’s voice held sorrow. He’d been close to his mom, as the oldest, her death had hit him hardest. Well, Jason couldn’t take anything back now. The ad for a wife was already on CHUMS and that was that. The Christian dating site claimed it could unite anyone with the proper mate. CHristians United with Mates Scientifically or some other ridiculous and contrived phrase that was the basis for the equally ridiculous anagram was how it got its name, but if it got him a wife who could settle in before Christmas, he didn’t really care what the name of the site was. That said, he wasn’t sure hope was in his vocabulary at this point. If CHUMS did match him scientifically to the perfect mate, any woman who responded, would probably be stark, raving crazy. His kids would be traumatized for life. He eyed his kids again. Or she would be.